>>>This is a multi-unit set and the shipping cost will be adjusted to that of 8 DVDs. To learn more about the shipping cost, please visit our Help Page and look for shipping information. 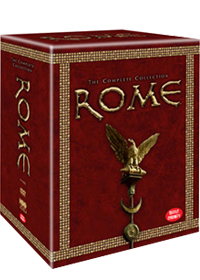 A generously budgeted show jointly produced by HBO and the BBC ROME takes viewers back to 52 B.C. for a chance to relive the reign of Julius Caesar. Details have been painstakingly researched to ensure accuracy so both history buffs and viewers less versed in the ways of Caesar should find something to enjoy here. The show also contains intricately woven plots fine acting and stunning recreations of the ancient city. This release contains the first two seasons of the show. Four hundred years after the founding of the Republic Rome is the wealthiest city in the world a cosmopolitan metropolis of one million people; epicenter of a sprawling empire. The Republic was founded on principles of shared power and fierce personal competition never allowing one man to seize absolute control. But now those foundations are crumbling eaten away by corruption and excess. After eight years of war two soldiers Lucius Vorenus and Titus Pullo unwittingly become entwined in the historical events of ancient Rome. A serialized drama of love and betrayal masters and slaves husbands and wives ROME chronicles a turbulent era that saw the death of the republic and the birth of an empire. The year is 44 B.C. Julius Caesar has been assassinated and civil war threatens to destroy the Republic. In the void left by Caesar's demise egos clash and numerous players jockey for position. The brutally ambitious Mark Antony attempts to solidify his power aligning himself with Atia but coming to blows with her cunning son Octavian who has been anointed in Caesar's will as his only son and heir. Meanwhile Titus Pullo attempts to pull his friend Lucius Vorenus out of the darkness that has engulfed his soul in the wake of personal tragedy. For once again the fates of these two mismatched soldiers seem inexorably tied to the fate of Rome itself.